We have read a lot of articles on how exercise benefits the heart, body weight, bones, etc. 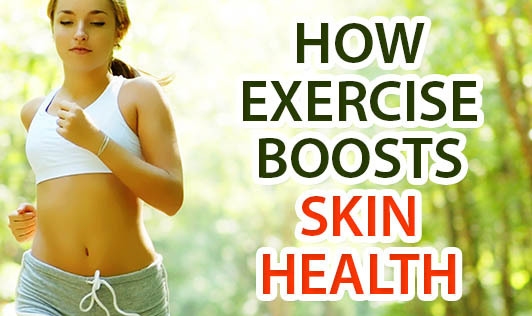 Let's see what role exercise plays in skin health. When you exercise, blood circulation to all parts of the body (including skin) increases. As you know, blood carries oxygen and nutrients to different parts of the body. When there's an increased blood flow to the skin, the amount of oxygen and nutrients also increase. During the reverse process (when blood moves away from the skin), the waste materials also get carried away in the blood. With better circulation of blood, the cycle of nourishment and cleansing works much better. Secondly, exercise reduces stress. If your skin problems have been aggravated due to stress, they can be kept under control with exercise. However, make sure you take adequate precautions while you exercise. If you exercise indoors, the hygiene should be good so that your skin is not affected while using machines or mats. If you exercise outdoors, protect yourself from sunburn, heat and pollution.